Usage: Home, office, and parties. We take pleasure in introducing ourselves as one of the leading organizations, engaged in offering a comprehensive range of SS Nut Bowl. We offer this bar glass to the clients at market leading rates. This is Silver Duck Shaped Plated Nut Dish made from brass with excellent quality silver plating. The silver plating remains good and is guaranteed for a period of 4 years of regular use. It lasts longer if not used on a daily basis. Text : Droplets - a set of three shiny tall bowls set on a sturdy natural stone base.It s fluid form feels like droplets of water spread on the stone. Designed to appeal to the eye, itâ€™s a beauty with a purpose. 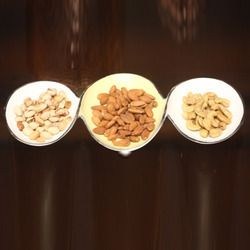 In one go you can serve three varieties of snacks to your guests. NA Copper + Natural Wood Nut Bowl, Size: 3x3x3"
Our customers can avail these Aluminium Nuts Bowl in various sizes and specification. 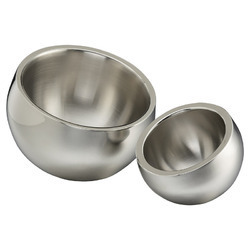 We make sure that the highest quality raw materials are used in the manufacturing of Bowls. Product Detail: Silver Nut Bowl with rose quartz. Elegant piece with modern cut work and designing.